Big Poppa Eats: New cookbook, new cobbler. My personal cooking passion is baking. I am always on the look out for new recipes for cakes, pies, etc. That said, I live in a "real" NYC apartment, so room is an issue and I have to be judicious when it comes to buying a new cookbook. I am also a cynical New Yorker, so anything too "cutsie" or "southern" tends to immediately raise a red flag for me and draw my ire, and the cover of this book screamed "cute" and "southern." And I will be honest, the Foreword from Paula Deen and quote from her son on the back cover had already turned me off. I kept looking and walking away. 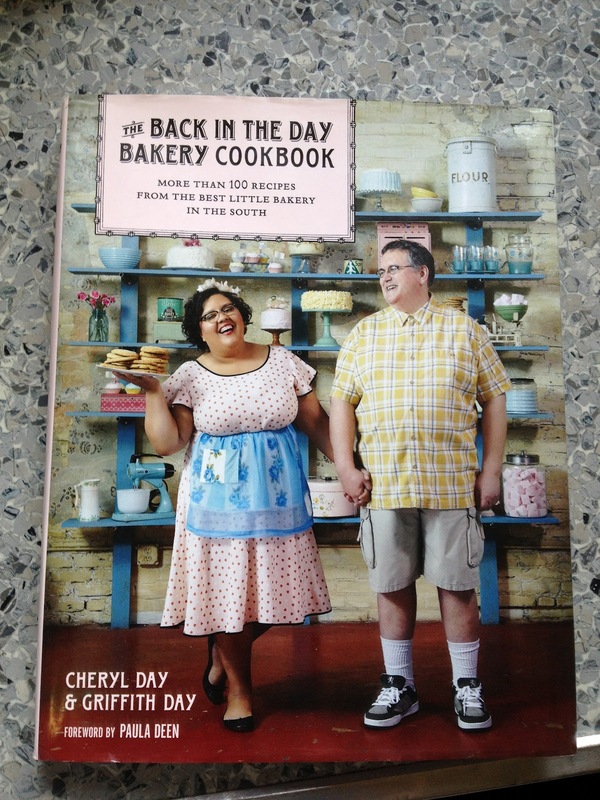 Cheryl & Griffith Day are the owners of the Back In The Day Bakery and authors of this cookbook, and they are on the cover. I had never heard of them or their bakery. Maybe they are well known. Maybe they have a show on CMT. I honestly don't know. This cookbook was my first introduction to them. And the picture of the two of them is what kept bringing me back. Maybe it was the way Cheryl was doing a curtsy in her pink heart dress and apron while holding a plate of cookies. Maybe it was the way Griffith, looking like an overgrown 10 year old, held her hand and and looked at Cheryl. Maybe it was the complete lack of cool or irony in the photo. There was something about them that seemed genuine and refreshing. I was starting to let my guard down. About the fourth or fifth time I had picked up the cookbook I decided to really go through it. The ultimate test for me is to page through a cookbook and see how many recipes are for things I would actually like to eat, how realistic the recipes are for a home cook, and to be sure I don't already have cookbooks at home that cover the same ground. As you have figured out, this one passed the test. In particular, the test of "do I want to eat that" went something like this: "Yes, yes, hell yes, oh man yes, ohhhh that looks good." Late summer is in full season here, and that means the greenmarkets are at their best right now. Barnes & Noble stands across the street from the Union Square greenmarket. I hit both with my girls on Wednesday. It is all about peaches and blueberries for me right now. I knew I wanted to make something with them as the filling so I stocked up on both. When I got home, I pulled out the Back In The Day Bakery Cookbook and thumbed through. There was a Rustic Peach-Blueberry tart recipe that looked good but, would take a little more time then I had. (I am going to make that one soon and I will post the results). I decided on a cobbler, and used their recipe for Blackberry Cobbler as my Guide. This was the first thing I made from this cookbook, and it was great. Blueberry-Peach Cobbler. Total winner. I paired it with some home made vanilla ice cream (more on making your own ice cream and my awesome Salton ice cream maker later). They were showing a double feature of "Fantastic Mr. Fox" and "Priceless" (an Audrey Tautou film) here so we ate it outside, on the grass, on a perfect August night. Life is good. First recipe, first try, a home run. Can't wait to to try more recipes. I know Cheryl and Griffith won't let me down. My mouth is watering! Cobbler looks awesome, as do Days. WAIT A MINUTE: WHERE IS THE RECIPE????? This thing looks amazing - toasty/gooey combination, yum.